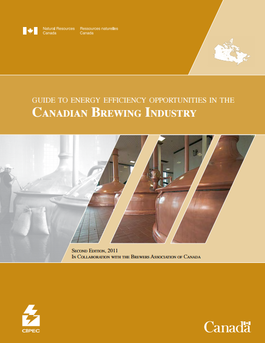 Guide to Energy Efficiency Opportunities in the Canadian Brewing Industry, 2011, a joint project of Beer Canada and Natural Resources Canada, revises and updates an earlier edition of the same title produced by Lom & Associates Inc., released in 1998. Present related industry performance trends and data where available both in Canada and abroad. The guide is also intended to assist in the development and achievement of voluntary sector energy efficiency targets, under the auspices of the Canadian Industry Program for Energy Conservation (CIPEC). Beer Canada is a member of CIPEC representing the brewing industry sector. Click the image to the right to download the guide.